Before getting to the good part, we at Soltech Security want to thank those who have took their time in reading our blogs, as well as contributing greatly to our social media offers and giveaways. We also very much appreciate the honest reviews and opinions that our readers/customers have left in order for us to improve and satisfy our customers. Please don’t forget to follow us on Facebook, Twitter, and Instagram for weekly updates, and once again, thank you guys! 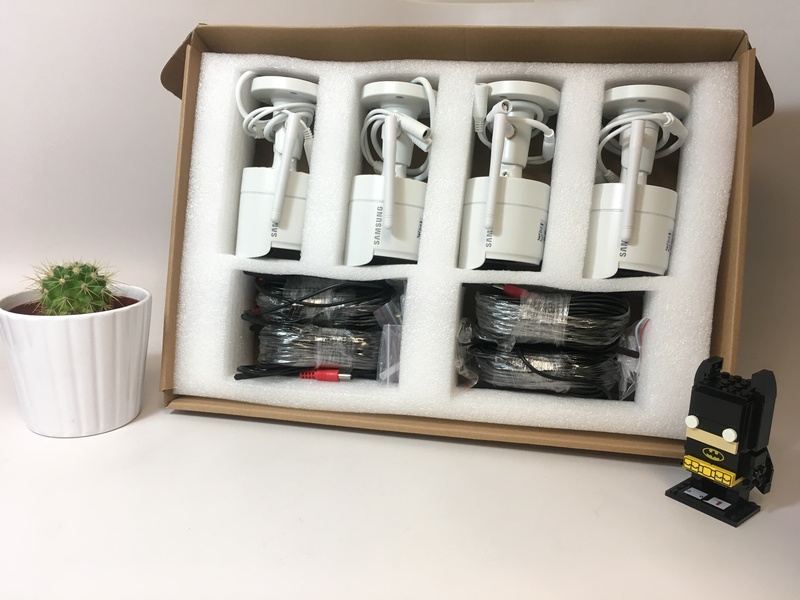 To get things started in this month’s article, we are thrilled to tell you guys that we have finally received our brand new Samsung Wireless Security System. The SNK-B73040BNW is a 4 channel NVR system that allows you to monitor 4 locations inside and outside. It is included with a 1080p Full HD recording NVR, four 1080p Wireless Cameras, 105° wide angle view, and night vision up to 130 ft. Not to mention, the cameras are IP-66 weather resistant so no need in worrying about heavy rain or abundant dust exposure. Lastly, with the free Samsung WiseView app, you have the convenience of viewing your feed anytime from anywhere around the world. Although, I can go on and on about the specs and features of this system, like any other electronic devices out there, there isn’t a perfect electronic security system. Therefore, we are taking this time to present our readers the Pros and Cons of our new wireless system. Peanut butter and jelly. Cookies and milk. Salt and pepper. Wireless and convenience. Hopefully, we can all agree that the items that I have listed go hand in hand with each other to bring out the best of their qualities. Just like how cookies and milk complement each other, wireless systems gives convenience a whole ‘nother meaning. One of the best parts about the SNK-B73040BNW being wireless is, well, that they are wireless! The fact that people don’t need to hire a technician to install their cameras for them can save significant amount of money and time. Also, with most security systems running on BNC cables, we have gotten a few complaints from our customers stating that they cannot remove the cameras down due to the installation that their technician has done, and re-wiring all the BNC cables will cost them a fortune. Furthermore, with neither BNC cables nor couplers required, the installment won’t be looking like a snake pit. With every positive, comes a negative. The downside of having the SNK-B73040BNW is that with all wireless security systems, there will be a chance that you will lose network connection. Due to the wireless connection depending strongly on Wi-Fi signals to operate, like any other electronic devices that depend on Wi-Fi, there will be times when your Wi-Fi signal becomes weak or temporarily shuts off; which of course means your security system will suffer the consequences. Another downfall of purchasing the SNK-B73040BNW is that you may have less of a range than your standard BNC wired systems. With an ordinary BNC cable system, because the wires are simply attached to the DVR, you will have more range depending how long your cables are. However, like mentioned before, because wireless systems like the SNK-B73040BNW depend on Wi-Fi, your range will vary. Lastly, when testing out the unit, the resolution of the cameras were superb, however, one thing that bothered me about the SNK-B73040BNW was the delay that I have experienced. Although, it is understandable that it is due to the cameras being wireless, I was still hoping for along the lines of impressive. To sum it up, the SNK-B73040BNW is a system that delivers to your convenience. I’m not just talking about the wireless portion of the system, but the convenience of installing the cameras on your own time and where you want to install them. However, like mentioned before, when any electronic device is wireless, it is inevitable that you may lose connection. Just like how your cellular phone can go offline due to no Wi-Fi or service, it can go likewise with the SNK-B73040BNW. But, for those who want to save some extra money by not calling in a technician, wireless is your option. Again, because something is wireless, does not mean that it will be better. Standard wired systems, like our SDH-C75100, will provide you the same quality and purpose. Also, because the wires are attached to the DVR itself, it will neither give you harsh delays nor will it go offline. At the end of the day, the choice is yours! Once again, thank you everyone for your time, and please feel free to comment or ask any questions in the comment section below. Is Our Brand New Samsung Wisenet Baby Monitor (SEW-3057W) Right For You?